On the design surface, you can drag any controls from the toolbox, as well as typing any literal text. By moving to Source view, you can add other HTML content to the template and set attributes to display the item's value. 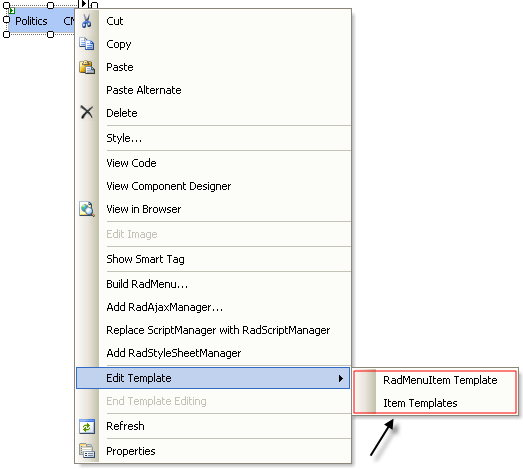 You can edit templates for all items using the RadMenuItem Template. You can also edit templates for individual menu items. 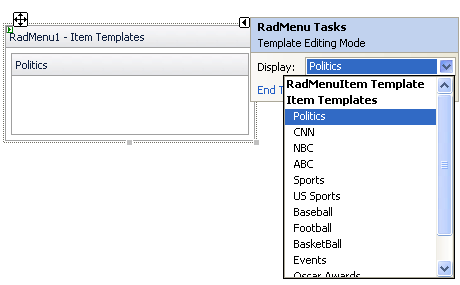 Once you have added menu items to your RadMenu component, select a specific item from the list of item templates in the Smart Tag, or edit them all at once by choosing Edit Template | Item Templates from the RadMenu context menu. 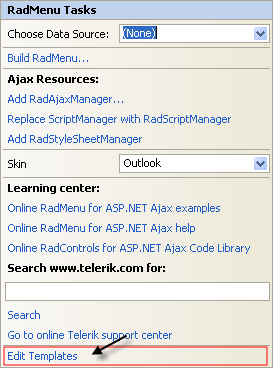 When you have finished designing your template, choose End Template Editing from the RadMenu context menu or Smart Tag.